LAS VEGAS -- Samsung Electronics is accelerating the development of multiple types of robots that support various tasks, powered by the company’s artificial intelligence platform, according to the company on Monday. During a global conference held at Mandalay Bay Hotel in Las Vegas, a day before the opening of the Consumer Electronics Show 2019, Samsung unveiled for the first time three kinds of AI-based robots branded as Samsung Bot, and three other wearable robots -- known as gait-enhancing and motivating systems -- for supporting rehabilitation treatments. Samsung offered a peek into the “future of connected living” by demonstrating latest developments in the robotics platforms. There were three versions of the AI-based Samsung Bot that provide care services for senior citizens; air quality management services for homes; and customer service at retailers. Samsung Bot Care takes care of a user’s health information, or vitals, including blood pressure, heartbeat, breathing and sleep quality, and keeps track of the user’s medication schedule. If the user accidentally falls down or faces an emergency situation, such as a heart attack, the robot is able to call an ambulance and alert family members. Samsung Bot Air, equipped with simultaneous localization and mapping technologies, is capable of sensing contaminated areas in a house and keeping the air clean. Samsung Bot Retail -- the tallest one among the three with a display -- supports taking orders, serving customers and making payments at shops. It can also provide product and shop information on the screen. The development of the AI-based robots is spearheaded by Samsung Research, the control tower of the tech giant’s research and development of AI. At the company’s exhibition hall at the CES 2019, Samsung also showcased GEMS, a wearable robot for rehabilitation treatments, which has been confidentially developed by the Samsung Advanced Research Institute. Samsung GEMS helps users with difficulties in walking, due to weakened muscles, diseases or injuries. It assists them in walking more easily with less stress to the muscles. The institute is currently developing three types of GEMS for the hips, knees and ankles. 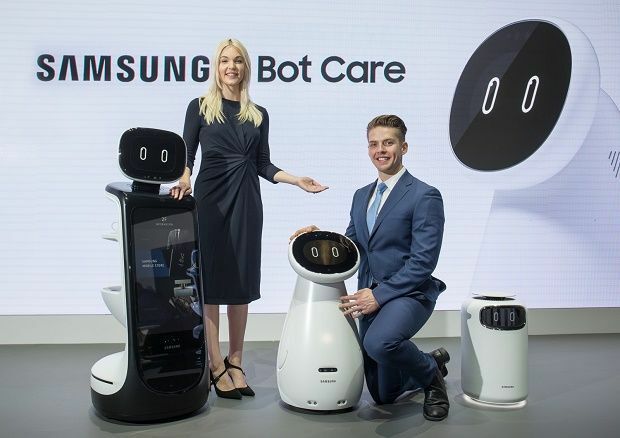 “Samsung will continue introducing new categories of robots that will offer new lifestyles for consumers, reflecting social needs to improve the quality of life,” it said. Kim Hyun-suk, president and CEO of the consumer electronics division at Samsung, said, “2019 is Samsung Electronics 50th anniversary, and for the last five decades, we’ve been committed to bringing meaningful innovations to consumers everywhere. Samsung had, up until now, refused to confirm that it is developing robots. However, LG announced last year that it would focus on robot development as one of the new growth businesses, with an aim to make profits from robots in three years. LG exhibited its five kinds of CLOi robots, including the most popularized guide robot at the airport, at its booth at the Las Vegas Convention Center. LG, this year, came up with a new wearable suitbot that helps workers unload or load heavy objects from high shelves.